Hello again! I hope you are having an amazing week so far! I feel like a good start to your week can truly make the whole week fly by! Anyway, I really am excited to write about this topic! 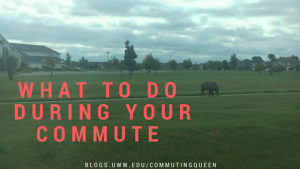 I know that typically, commuter students have a fairly short ride to their school. This can be anywhere from 15 to 30 minutes. But lets not forget about students, like myself, who have a slightly longer commute. My average ride takes about an hour; sometimes it takes even longer. This ride was fun at first, but now it is just long. After about a week of making that same drive, my own music started to get seriously repetitive. Anyway, regardless of the amount of time you spend in the car, I think we can all agree that after a while it can become boring. So, I have done a bit of experimenting and now I think I have at least 3 tricks to spice up your commute! 1. UTILIZE NETFLIX DOWNLOADS: Okay, I think that this is honestly one of the coolest features Netflix has ever developed. Now, you are able to download certain movies or t.v. show episodes from Netflix. When you download something, it is saved under a section called downloads. You are then able to watch what you have downloaded even if you cannot access WiFi! It’s wonderful and makes your drive more exciting! 2. UTILIZE PANDORA OR SPOTIFY: These are just the most popular types of music applications I know of. Regardless, they are fantastic for giving you a variety of music, some which you may have never heard before, and can definitely make your ride new and exciting! 3. TALK TO SOMEONE ON THE PHONE: Sometimes, this can be tricky… but if you have bluetooth capability or even a speakerphone it is definitely a good trick. Talking to someone on the phone during a portion of your commute can break up the drive and even make it more enjoyable. Choose to call one of your funniest friends or your most talkative relative and I promise the drive will fly by! Now, these are just a few of the different ways that I have tried to make my commute easier, but I am sure that there are other ideas out there that could work just as well! If you have any other tips or tricks please comment them below! I would love to hear them! Thank you so much for reading my content! This entry was posted in Tips&Tricks and tagged commute, drive, easy, netflix, pandora, spotify. Bookmark the permalink.